The 2017 Arizona Game and Fish Department Outdoor Expo, presented by Shikar Safari Club International, will be held Saturday, March 25 and Sunday, March 26, at the Ben Avery Shooting Facility in Phoenix. Admission and parking are free. 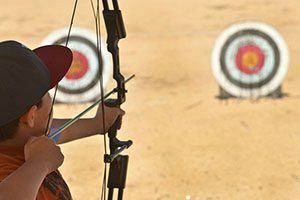 Want to know what Arizona’s largest hands-on outdoor expo is like? See this video with highlights of last year’s Expo. You can also visit with more than 100 exhibitors, including outdoor recreation and conservation groups, government agencies, and commercial vendors of outdoor products and services. New this year is an expanded line of firearm manufacturers. Don’t forget to talk about the event using #AZGFDexpo. Expo hours are 9 a.m. to 5 p.m. on Saturday, March 25, and 9 a.m. to 4 p.m. on Sunday, March 26. The 2017 Outdoor Expo is easy to get to, located on Carefree Highway, about 1/2 mile west of I-17 in Phoenix.